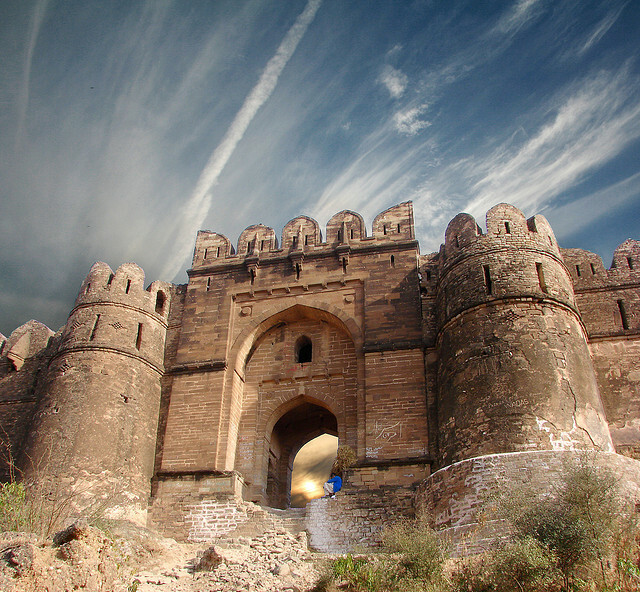 Rohtas Fort is an example of early Muslim military architecture. It blends architectural and artistic traditions from Turkey and the Indian sub-continent to create the model for Mughal architecture. It was built in 1541 and survives intact till today .The Fort is a complex of defensive works, including walls, bastions, gates, a small mosque and a haveli (private mansion). A village has developed within the walled compound. Sher Shah constructed Rohtas Fort to block Emperor Humayun's return to India after defeating him in the Battle of Kanauj. This fort lies on the old GT road between the North (Afghanistan and western Pakistan today) to the Plains of Punjab. The reason of its construction was to suppress the local tribes of this region Potohar. Sher Shah Suri was well aware of the bravery of Potohari people since they had the history for defending their lands for thousands of years and the old king of Northern Punjab known as King Porus challenged Alexander the Great and fought so hard that Alexander decided to leave him as a King of Peruvia that was later known as Northern Punjab or Potohar.